Verizon taking pre-orders on BlackBerry Pearl 8130 | BlackBerry Blast! 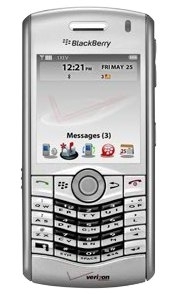 Verizon is currently taking pre-orders on the BlackBerry Pearl 8130. Expected to be available on November 8, 2007, customers can now pre-order a BlackBerry Pearl on Verizon's web site. If you sign up for a 2-year contract and get the online discount of $100, you can get one for $199.